Anxiety is an emotional state characterized by physiological arousal, unpleasant feelings of tension, and a sense of apprehension. Anxiety has been recognized as one of the most common disorders among adolescents. , If the anxiety is left untreated, it may lead to other psychological problems such as depression, suicidal thoughts, behavioral problems and drug abuse. ,,, Anxiety is a prevalent problem among adolescent in Iran especially among girls. ,, Hence, with the prevalence of anxiety disorders among adolescents it is important to make a systematic evaluation to assess anxiety disorder using a valid and reliable instrument. In Iran, the BAI has become increasingly popular as an instrument to assess anxiety both in basic and applied research. In fact, the first various translations of the BAI have been published by Dr. Mahmuod Mansour and BAI was introduced to Iranian psychologist. Although BAI examined the psychometric in 2008 by Kaviani and Mosavi was entitled "psychometric properties of the Persian version of BAI",  we have not found any study that specifically analyzes the psychometric properties of any adolescents samples in Iran. The purpose of this study was to examine the psychometric properties of the BAI for Adolescents in Northern Iran. In the current study, we examined the reliability and validity of scores on the BAI with adolescents North of Iranian. The mixed findings on the psychometric properties found past studies signify the need to test the psychometric properties of BAI when used on different samples. Furthermore, many studies testing the psychometric properties of the BAI have used EFA. The use of EFA has its limitations as this analysis cannot make distinctions between competing factor structures and also accounts the measurement error in the scores. Hence, the use of CFA has been suggested as more appropriate to address these limitations. There have been considerably not many studies that have used CFA in testing the psychometric properties and validity of BAI. Three studies have employed CFA, namely Osman et al., Sæmundsson, et al., and Chapman et al. reported different BAI factor structures. ,, Osman et al. reported a two-factor structure, Sæmundsson, et al. reported a one-factor structure as the best model, meanwhile Chapman et al. suggested an alternative two-factor model for African-American sample. Furthermore, since the BAI is now being used on Iranian population, it is also important to test the convergent and discriminant validity of the BAI due to different cultural background. We conducted a CFA of the BAI based upon the three previously described existing factor structures of the BAI. The BAI is a widely used self-report measure of anxiety in psychiatric research and practice, as well as in nonclinical research. , BAI has also received international acceptance and has been translated into several languages ,,,, and also translated into Persian language and validated in the adult population in Iran. However, the psychometric properties of the BAI scale were not tested in Kaviani and Mosavi's study. Study has yet to be conducted to test the factor structure, validity and reliability of the Persian Version of the BAI among Iranian adolescents. The convergent and discriminant validity BAI are contrasted with those of a widely used measure, The self-rating anxiety scale (SAS), State-Trait Anxiety Inventory (STAI), symptom check list-90-R (SCL-90-R) and BDI-II. The research design in this study was a correlation. Correlational studies can suggest a relationship exists between variables. The target population of this study is teenagers in North of Iran (Guilan Province). Guilan is one of the provinces of Iran. It lies along the Caspian Sea. Participants in the study were a group of 783 teenagers, aged 15-19 years. Adolescents were school and nonschool from of north of Iran in 2011 to 2012, and who participate in the study. Average age of the sample was 17.93 years (standard deviation [SD] =1.64, range =15-19); 44.7% (N = 350) were female and 55.3% (N = 433) male. Based on the previous studies, we assumed a prevalence of 5%. With a precision of 1-95% confidence interval, taking into account the multistage clustering sampling method, we calculated the minimum sample size, and finally selected 783 adolescents for our study. Assuming 18 adolescents in each cluster, we selected 44 clusters that were proportionally distributed among health center districts. At first, the list of adolescents was obtained from the Guilan University of Medical Sciences (health departments). The number of adolescents was added up cumulatively. Selecting the location of the first cluster was based on a random number table. Then, using a systematic sampling technique, knowing the inter cluster interval, we selected the subsequent clusters. Totally, our sample included 350 girls and 433 boys. No history of psychiatric hospitalization, no serious organic disease, such as diabetes and having normal intelligence. Incomplete completion of the questionnaires. Initial evaluation was done by mental health professionals in Guilan University of Medical Sciences who have bachelor or master's degree in psychology. The factor structure of the BAI is less clear-cut. Steer et al., reported evidence for a four-factor model, while two different two-factor models have also been proposed. As a preliminary phase of the present study, we examined the cut point, reliability and validity the BAI. (1) Cronbach's alpha for each measuring instrument (BAI and SAS, STAI and SCL-90-R was conducted to confirm internal consistency. (2) Test-retest reliability in this study was performed twice between 1 and 2 weeks after first stage. (1) Exploratory factor analysis was conducted to identify the factor structure. (2) CFA was conducted using structural equation modeling to confirm the exploratory model in the main study. (3) Criterion-related validity was conducted to correlation "BAI" scores and BDI. Data were analyzed using by SPSS-22 (IBM company) and Amos 18. All statistical tests were two-sided. P = 0.05 was considered as statistically significant. In order to evaluate the internal consistency and item homogeneity, Cranach's alpha coefficient and the mean inter-item correlation coefficient were calculated. The acceptable level of alpha coefficient is >0.70,  and the optimal level of inter-item correlation coefficient is between 0.2 and 0.4. The corrected item total correlation coefficient of all 21 items was also calculated. 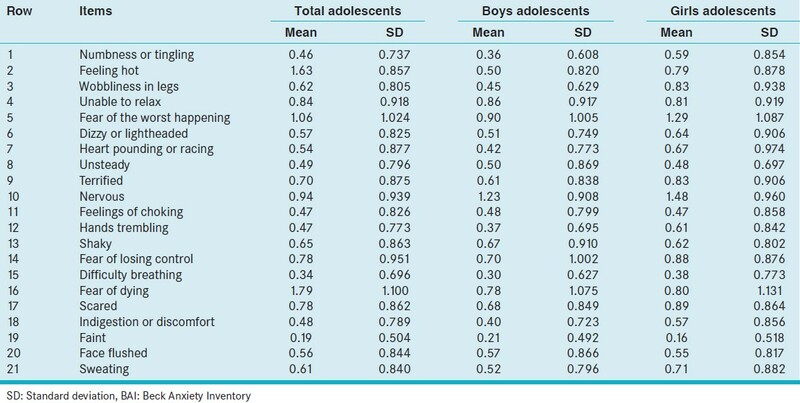 Demographic characteristics are shown in [Table 1]. The sample comprised a total of 783 participants. The age ranged from 15 to 19 years 44.7% (N = 350) were female and 55.3% (N = 433) male. About 24.4% was 15 years, 24.6% was 16 years, 25.8% was 17 years, 13.2% was 18 years, and the last 12% was 19 years. First, we conducted an independent t-test to examine the gender difference for the total BAI score and also examined the correlation between age and the total BAI score. There is a nonlinear relationship between age and the total score of the BAI, (t = 4.339, df =781) [Table 2]. The means, SD and alpha-coefficients for BAl, BDI-II, SAS, SCL-90-R and STAI are reported in [Table 3] (N = 783). For the BAl the range of scores was 0-57 with a mean of 8.02 (SD = 5.86). The skewness (1.98) and kurtosis (4.91) exceed desired limits. Analyses of internal consistency reliability for the Bal revealed a Cronbach's alpha = 0.88. The correlations [Table 3] BAI with the SAS (0.44), SCL-90-R (0.40) and with STAI (0.42) were moderate. But the correlation with the BDI-II was 0.216 for divergent validity. This is comparable to results reported in prior studies. Test-retest reliability was estimated by Pearson r correlation coefficient (0.67, P < 0.01, N = 231) after 1 and 2 weeks after. Means, SD and alpha-coefficients for the BAI, the BDI-II, SAS, the SCL-anxiety, the STAI are reported in [Table 3]. The Cronbach's alpha (0.88) of the BAI is slightly higher in these samples. On the other hand, the mean (8.1) is substantially higher in this sample, exceeding the SD (6.86). The item-total correlations of the BAI-items range from 0.49 to 0.88. Several of the items (2, 5, 15 and 20) reflecting physiological symptoms and item 16 "fear of dying" have low (0.35) item-total correlation. The distribution of each item is closer to normal in this sample; skewness and kurtosis are substantial for most of the items. Especially, item 15 difficulty breathing display substantial deviations from the normal distribution. Anxiety levels were determined according to the manual of the BAI indicate, A grand sum between 0 and 21 indicates very low anxiety. A grand sum between 22 and 35 indicates moderate anxiety. A grand sum that exceeds 36 is a potential cause for concern. For Iranian adolescents, a grand sum between 0 and 23 indicates very low anxiety. A grand sum between 24 and 42 indicates moderate anxiety. A grand sum that exceeds 43 is a potential cause for concern [Table 4]. Second, we performed a principal component factor analysis to explore the factor structure of the BAI. The correlation matrix for the 21 items was computed first, and Kaiser-Meyer-Olkin's measure of sampling adequacy (minimum acceptable level >0.50) and Bartlett's test of sphericity were calculated to verify the appropriateness of using factor models. Screen test criteria were used to determine the number of factors to extract [Table 5]. A principal components factor analysis with warimax rotation was chosen because it was consistent with the factor analytic approach used in the development of the BAI and because it was assumed any factors would be inter correlated. We tested four models (subjective, somatic, panic, neurophysiological). 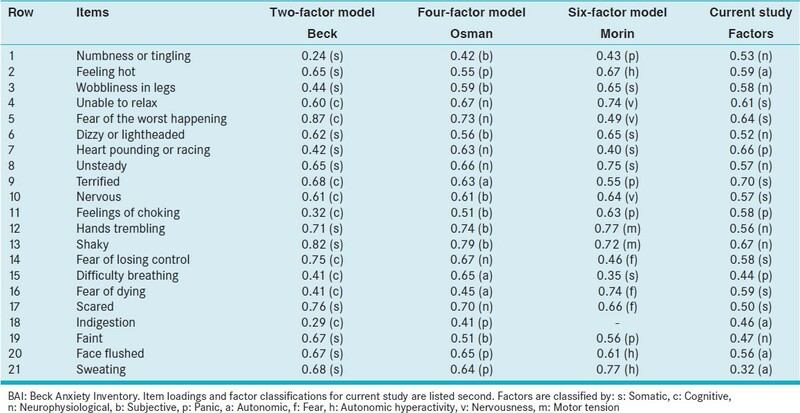 The Beck and Steer four-factor model and the Osman et al., second-order four-factor model. The models are presented with factor loadings in ascending order in terms of complexity. Examination of Eigen values and screen plots suggested a three-factor solution for both groups (boys and girls) [Table 6]. The first factor had an Eigen value of 6.36 and explained 30.29% of the variance for adolescents. The content of this factor suggested that items represented somatic symptoms. A second factor had an Eigen value of 4.56 and explained 70% of the variance for Iranian adolescents; this factor had an Eigen value of 1.77 and explained 8.46% of the variance. In EFA the factor labeled "subjective" in all models tested during conformational analyses. However, in all these analyses item 16 "fear of dying" had its highest loading on this factor as opposed to what was reported in the manual. Item 16 loading on the subjective factor is congenial with what was originally expected by Beck et al. Therefore, we chose to allow this item to load on the "Subjective" factor instead of the "panic" factor. This substantially increased goodness-of-fit for the model. The items eight "unsteady", items 12 "hands trembling" and 13 "shaky", items six "Dizzy or light-headed" and 19 "Faint" and items 11 "feelings of choking" and 15 "difficulty breathing", were correlated. All changes had a theoretical rationale and were supported by the Modification Indices. Each of these changes made substantial increases in the goodness-of-fit measures [Table 6]. The CFA was used to confirm the exploratory model. The results provided evidence that the developed instrument achieved sound psychometric properties. The CFA model fit was evaluated using multiple fit indices. The indices elected were the Chi-square statistics (x2 df =547.234), the comparative fit index (CFI) (CFI = 0.91), the standardized root-mean-square (SRMR = 0.05), the root-mean-square error of approximation (RMSEA = 0.04), and the Akaike Information Criteria (AIC = 694). A good model fit is indicated by values of 0.90 or higher for the CFI and GFI. For the SRMR and RMSEA, values of 0.05 or lower indicate a close fit, while values <0.08 indicate an acceptable fit and the one with the lowest AIC is preferred in model comparison. This study focuses on investigating the factor structure and internal consistency of the instrument in adolescents. The available and translatable articles that did provide reliability estimates were subjected to a reliability study. The BAI scores showed good to very good internal consistency, with coefficient alpha values. Findings showed that the Persian version of BAI proved a good reliability (r = 0.88, P < 0.001), a very suitable validity (r = 0.59.6, P < 0.001), given that almost 92% of the studies reporting coefficient alphas and almost 75% of the studies calculating test-retest reliability estimates used participants of both genders. The test-retest reliability was satisfactory and readily comparable with those obtained in other studies. The Iranian version of the BAI displays satisfactory reliability. Generally, there seems to be the reason to connect this item to a subjective or cognitive factor, instead of the other factors related to physiological items. Due to the difficulties in achieving satisfactory fit on the models examinated, explorative factor analyses were conducted. Results from these analyses slightly favored a four-factor model in the population sample as well as in the Iranian teenagers samples. The results from confirmatory as well as exploratory factor analyses support the validity of the Iranian version of the BAl, as it displays psychometric properties within a reasonable range of what has been obtained on the original version. Thus, the results in this study sustain the validity of the Iranian translation. In conclusion, the findings show that the BAI-Iranian has sound psychometric properties and is a reliable instrument for measuring levels of depression among adolescents in Iranian. Therefore, it can be used with confidence in the future. We specially thank to all the teenagers who participated in this study. We would also like particularly to acknowledge the contribution of coworkers (Psychologists) in Guilan University of Medical Science for helping us with the data collection for this study. Davison GC, Neale JM, Kring AM. Abnormal Psychology. 9 th ed. Hoboken, NJ: John Wiley and Sons, Inc.; 2003. Rapee RM, Kennedy S, Ingram M, Edwards S, Sweeney L. Prevention and early intervention of anxiety disorders in inhibited preschool children. J Consult Clin Psychol 2005;73:488-97. Barrett PM, Duffy AL, Dadds MR, Rapee RM. Cognitive-behavioral treatment of anxiety disorders in children: Long-term (6-year) follow-up. J Consult Clin Psychol 2001;69:135-41. Boland RJ, Keller MB. Course and outcome of depression. In Gotlib I, Hammen C, editors. Handbook of Depression. 3 rd ed. New York: Guilford; 2002. p. 43-60. Nordhagen T, Pallesen S, Nordhus H. Norwegian Version of the BAl. Unpublished Manuscript. Institute for Clinical Psychology, University of Bergen; 2000. Keenan K, Hipwell AE. Preadolescent clues to understanding depression in girls. Clin Child Fam Psychol Rev 2005;8:89-105. Chakraburtty A. Stress, Anxiety, and Depression: How They Affect Your Health. 2005. The Cleveland Clinic. Available from: http://www.webmd.com/depression/stress-anxiety-depression [Last accessed on 2012 July 16]. Emami H. Epidemiological Studies on Mental Health in Tehran-Iran. UMEÅ UNI VERSI-TY Medical Dissertaion from Department of Clinical Science. Umeå, Sweden: Division of Psychiatry Umeå University; 2008. p. 901-85. Hossinifard SM, Birashk B, Atef Vahid MK. Epidemiology of mental disorders in high-school students in Rafsanjan. Iran J Psychiatry Clin Psychol 2005;11:71-80. Mohebi S, Sharifirad GH, Shahsiah M, Botlani S, Matlabi M, Rezaeian M. The effect of assertiveness training on student′s academic anxiety. J Pak Med Assoc 2012;62:S37-41. Magán I, Sanz J, García-Vera MP. Psychometric properties of a Spanish version of the Beck Anxiety Inventory (BAI) in general population. Span J Psychol 2008;11:626-40. Kaviani H, Mosavi AS. Psychometric properties of the persion version of Beck Anxiety Inventory. Tehran Univ Med J 2008;65:136-40. Beck AT, Epstein N, Brown G, Steer RA. An inventory for measuring clinical anxiety: Psychometric properties. Journal of Consulting and Clinical Psychology 1988;56:893-7. Beck AT, Steer RA, Beck JS. Types of self-reported anxiety in outpatients with DSM-III-R anxiety disorders. Anxiety Stress Coping Int J 1993;6:43-55. Nordhagen T. Beck Anxiety Inventory: Translation and Validation of a Norwegian version. Master′s Thesis. University of Bergen; 2001. Available from: http://www.ub.uib.no/elpub/2001/h/308004/Hovedoppgave.pdf [Last accessed on 2012 Aug 24]. Hewitt PL, Norton GR. The Beck Anxiety Inventory: A psychometric analysis. Psychol Assess 1993;5:408-12. Contreras S, Fernandez S, Malcarne VL, Ingram RE, Vaccarino VR. Reliability and validity of the beck depression and anxiety inventories in Caucasian Americans and Latinos. Hisp J Behav Sci 2004;26:446-62. Kumar G, Steer RA, Beck AT. Factor structure of the Beck Anxiety Inventory with adolescent psychiatric inpatients. Anxiety Stress Coping 1993;6:125-31. Chapman LK, Williams SR, Mast BT, Woodruff-Borden J. A confirmatory factor analysis of the beck anxiety inventory in African American and European American young adults. J Anxiety Disord 2009;23:387-92. Morin CM, Landreville P, Colecchi C, McDonald K, Stone J, Ling W. The Beck Anxiety Inventory: Psychometric properties with older adults. J Clin Geropsychology 1999;5:19-29. Osman A, Hoffman J, Barrios FX, Kopper BA, Breitenstein JL, Hahn SK. Factor structure, reliability, and validity of the Beck Anxiety Inventory in adolescent psychiatric inpatients. J Clin Psychol 2002;58:443-56. Muntingh AD, van der Feltz-Cornelis CM, van Marwijk HW, Spinhoven P, Penninx BW, van Balkom AJ. Is the Beck Anxiety Inventory a good tool to assess the severity of anxiety? A primary care study in the Netherlands Study of Depression and Anxiety (NESDA). BMC Fam Pract 2011;12:66. 24 . Beck AT, Steer RA, Gabin M. Psychometric properties of the BDI: Twenty-five years of evaluation. Clin Psychol Rev 1988;8:77-100. Sanford SD, Bush AJ, Stone KC, Lichstein KL, Aguillard N. Psychometric evaluation of the Beck Anxiety Inventory: A sample with sleep-disordered breathing. Behav Sleep Med 2008;6:193-205. Clara IP, Cox BJ, Enns MW. Confirmatory factor analysis of the depression-anxiety-stress scales in depressed and anxious patients. J Psychopathol Behav Assess 2001;23:61-7. Lahey BB, Applegate B, Waldman ID, Loft JD, Hankin BL, Rick J. The structure of child and adolescent psychopathology: Generating new hypotheses. J Abnorm Psychol 2004;113:358-85. Watson D, O′Hara MW, Simms LJ, Kotov R, Chmielewski M, McDade-Montez EA, et al. Development and validation of the Inventory of Depression and Anxiety Symptoms (IDAS). Psychol Assess 2007;19:253-68. Kjaergaard M, Arfwedson Wang CE, Waterloo K, Jorde R. A study of the psychometric properties of the beck depression inventory-II, the montgomery and åsberg depression rating scale, and the hospital anxiety and depression scale in a sample from a healthy population. Scand J Psychol 2014;55:83-9. Aasen H. An empirical investigation of depression symptoms: Norms, psychometric characteristics and factor structure of the beck depression inventory-II. University of Bergen; 2001. Available from: http://www.ub.uib.no/elpub/2001/h/308003/Hovedoppgave.pdf [Last accessed on 2012 Dec 11]. De Ayala RJ, Vonderharr-Carlson DJ, Kim D. Assessing the reliability of the Beck Anxiety Inventory scores. Educ Psychol Meas 2005;65:742-56. Jylhä P, Isometsä E. The relationship of neuroticism and extraversion to symptoms of anxiety and depression in the general population. Depress Anxiety 2006;23:281-9. Gregory RJ. Psychological Testing: History, Principles, and Applications. 5 th ed. Boston: Pearson Education, Inc.; 2007. Modabernia MJ, Shodjai Tehrani H, Fallahi M, Faghirpour M. Normalizing SCL-90-R inventory in Gilan high-school students. J Gilan Univ Med Sci 2010;75:58-65. Steer RA, Ranieri WF, Beck AT, Clark DA. Further evidence for the validity of the Beck Anxiety Inventory with psychiatric outpatients. J Anxiety Disord 1993;7:195-205. Hair JF, Anderson RE, Tatham RL, Black WC. Multivariate data analysis. 4 th ed. Saddle River, NJ: Prentice Hall; 2010. Beck AT, Steer RA. Manualfor the Beck Anxiety Inventory. San Antonio, TX: Psychological Corporation; 1990. Ayala RJ, Vonderharr-Carolson DJ, Kim D. Assessing the reliability of the Beck Anxiety Inventory scores. J Educ Psychol Meas 2005;65:742-56. Willson K, de Beurs E, Palmer C, Chambless D. Beck Anxiety Inventory. In Maruish ME, editor. The Use of Psychological Testing for Treatment Planning and Outcomes Assessment. 2 nd ed. Mahwah, NJ: Lawrence Erlbaum; 1999. p. 971-93. Vacha-Haase T, Henson RK, Caruso J. Reliability generalization: Moving toward improved understanding and use of score reliability. Educ Psychol Meas 2002;62:562-9. Ferguson R. Using the Beck Anxiety Inventory in primary care. In: Maruish M, editor. Handbook of Psychological Assessment in Primary Care Settings. 1 st ed. Mahwah, New Jersey: Lawrence Erlbaum Associates, Inc., Publishers; 2000. Fydrich T, Dowdall D, Chambless DL. Reliability and validity of the Beck Anxiety Inventory. J Anxiety Disord 1992;6:55-61. Cox BJ, Cohen E, Direnfeld DM, Swinson RP. Does the Beck Anxiety Inventory measure anything beyond panic attack symptoms. Behav Res Ther 1996;34:949-54. Cox BJ, Cohen E, Direnfeld DM, Swinson RP. Reply to steer and beck: Panic disorder, generalized anxiety disorder, and quantitative versus qualitative differences in anxiety assessment. Behav Res Ther 1996;34:11-2. Kabacoff RI, Segal DL, Hersen M, Van-Hasselt VB. Psychometric properties and diagnostic utility of the Beck Anxiety Inventory and the state-trait anxiety inventory with older adult psychiatric outpatients. J Anxiety Disord 1997;11:33-47.